With “Pre-modern Books in Japanese” as the keyword, the “Project to Build an International Collaborative Research Network for Pre-modern Japanese Texts (NIJL-NW project)” was inaugurated at the National Institute of Japanese Literature in 2014. As well as participation in the implementation of the project by a base of twenty domestic universities, plans are also in place for coordination with institutions including overseas universities research facilities with Academic Exchange Partner Organization of the National Institute of Japanese Literature taking the central role. With the National Institute of Japanese Literature the leading role, it is planned to implement project by promoting activities through coordination between twenty universities serving as the base in Japan as well as overseas universities and research with the focus on organizations that have signed Academic Exchange Agreements with the national Institute of Japanese Literature. As well as achievements realized through research including the deepening of research in a wide diversity of fields and evolution through transdisciplinary research, the project is expected to results such as the realization of measures to address risks to cultural assets through the conversion of images into data. The main expected results arising from the project are listed below. Up to the present time, the main pre-modern books used as research materials have, on the whole, belonged solely to the fields of Japanese literature and historical studies. The reason for this is that both the means of discovering the whereabouts of such materials and the number of persons able to read cursive script (characters written in cursive style) have been limited. Moreover, because pre-modern books are also considered to be valuable and deemed to be cultural assets, even in case where the whereabouts is known, perusal is often not possible because of the risk of degradation. This project aims to resolve these problems by converting images of the original books into data and, furthermore, to make simultaneous use of empirical research of textual renditions to contribute to research is a wide range of fields. It is anticipated that the availability for viewing and reading of the originals of materials which it has never been possible to verify will serve to deepen research not only in fields such as Japanese literature and history, but also in other areas of research. During the process of building the “Pre-modern Japanese Book Database” that will serve as an organized foundation for transdisciplinary research, the opinions and views of research communities in all fields will be taken on board so that materials will be converted into data in order with prioritization on literature likely to be most often used. In addition, it is anticipated that the process of considering what kind of keywords are important and picking out keywords from cursive texts will promote exchanges between previously unrelated fields, leading to the development of transdisciplinary research based on new ideas. Because a great deal of time has passed since their creation, in many cases, text in pre-modern books has become illegible due, for example, to degradation of the paper itself or damage caused by insects (damage resulting from holes created by insects). It is, therefore, essential to store such books as valuable documents to prevent any further degradation. Moreover, it cannot be denied that some such books may be lost due to disasters (e.g. Earthquakes, tsunami, fire). To address this issue, if were possible to preserve high-quality images of such books that had the precise appearance of the originals, exposure of the originals to environments that facilitate degradation could be reduced and, moreover, even if the originals were lost due, for example, to disasters, their content would be preserved in a state close to the originals. Although images have also been preserved in the past on microfilm, the aim of this project is to create a database that is easier to use by converting originals into digital images. Since the database created by this project will be made available to the public on the internet, images of the originals of pre-modern books will be available for perusal by anyone, anywhere at any time. Images of documents that have been available for viewing only by limited groups such as researchers will become viewable by anyone for the first time. Pre-modern books that were written and read up to the beginning of the Meiji era that exist in vast numbers and provide a record of life and culture in Japan before changes triggered by wide-ranging contact with modern times in the west and are, therefore, a valuable cultural source that serves to covey such aspects of Japan to future generations. 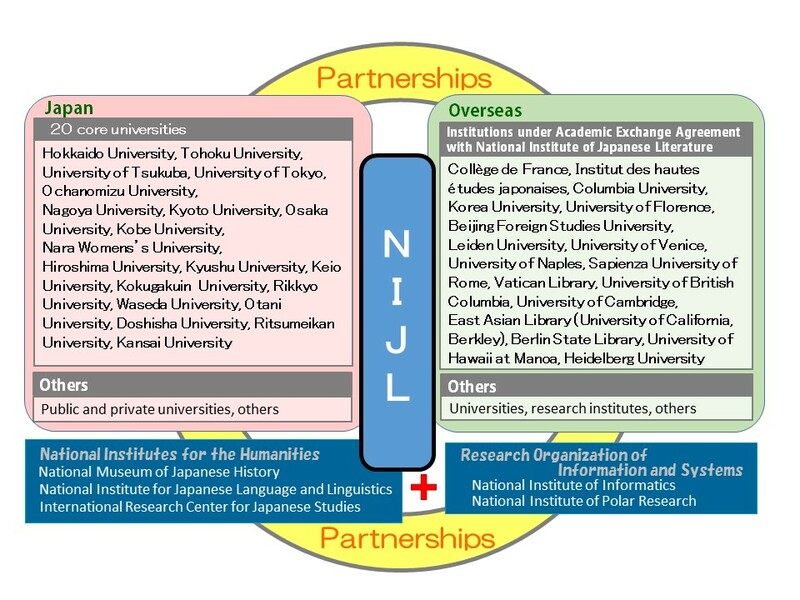 The “Project to Build an International Collaborative Research Network for Pre-modern Japanese Texts” aims to create a research network with the participation of researchers in a wide range of fields in both Japan and overseas, thereby shedding light on the enormous amount of pre-modern Japanese books through new research and making them available for use as intellectual resources. During the process of achieving the goals of the project, the task of building a database comprising images of 300 thousand pre-modern Japanese books covering all fields will be undertaken hand in hand with universities in Japan and pioneering research open to researchers in a wide diversity of fields will be conducted. In carrying out this project, we will construct a “Pre-Modern Japanese Book Data Base” as a foundation for research. This will be a data base for the academic research of pre-modern Japanese books and it will be largest data base and the only data base of this size in Japan. There have been data bases created at places such as universities and reference libraries before, but contents were focused on pre-modern books owned by that place. The data base to be constructed will include about 300 thousand of the 500 thousand items listed in the “Kokusho Somokuroku” (General Catalogue of Japanese Writings published by Iwanami Shoten) and has a system in which information on pre-modern books belonging to multiple institutions can be searched in one setting. It will be an unprecedented scale as a data base which includes images of pre-modern books. This project will construct a data base system which integrates scanned data of materials and catalogue information from the “Union Catalogue of Early Books Database”. It is possible to understand the location of materials being searched for more quickly and accurately by being able to confirm image data simultaneously, and enables confirmation of the contents without going to the location of the materials. What is the significance of adding image information of the materials to the catalogue information of the “Union Catalogue of Early Books Database” which is already on display? Understand what types of characters it is written in. Understand the arrangement of characters and writing techniques. See how the illustrations are in the materials. See the pattern and colors of the buildings drawn in the materials. See the structure of the buildings drawn in the materials. These are some examples of the many things which can be seen from images. It becomes possible to understand the details of the book which could not be understood with only the catalogue information. Copyright c National Institute of Japanese Literature All Rights Reserved.